Today I will be reviewing the Jaco Unity Lightweight BJJ Gi. I am not being paid for this review but this jacket was sent to me by JACO to review. I got an A1 for size. In terms of looks and size, this looks and fits almost exactly like Fuji BJJ Uniform I got on Amazon. I took a side-by-side picture of the two for comparison. On the left is my Fuji BJJ gi and on the right is the JACO Unity Lightweight gi. The both look similar. However, upon closer inspection and especially when wearing it, you start to feel the difference. 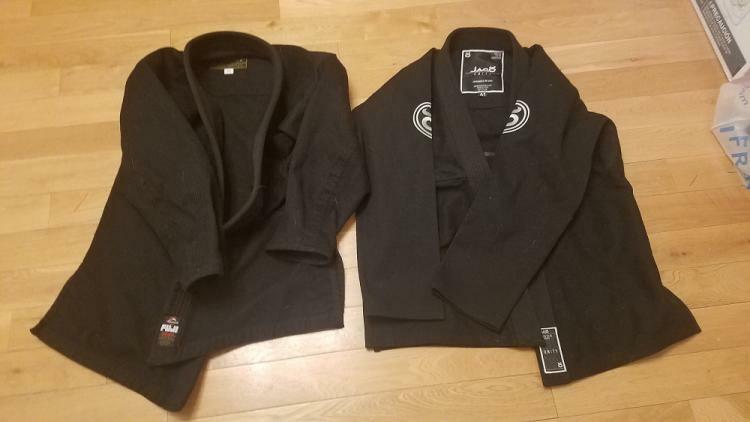 You can see how much thinner the JACO gi is looking at it side-by-side, especially around the neck area. Initially I thought "thinness" of the gi might pose a problem when grappling so I made sure to test out the gi with a lot of grappling. I've bought a cheaper Fuji gi in the past (not the one above) and it ripped after a month so I wanted to make sure this one would hold up. It held up well. 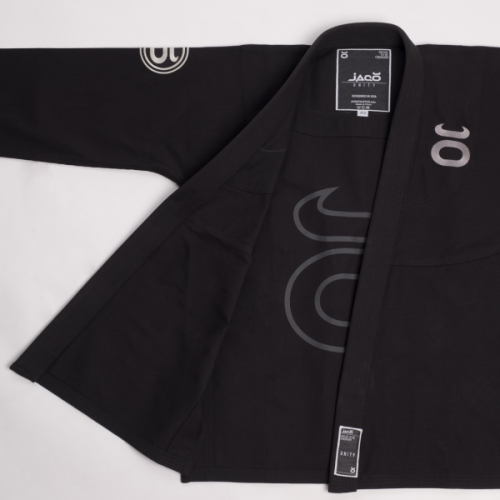 Fabric: The Jaco Unity Gi is a 350 GSM (grams per square meter) Pearl Weave Jacket. It comes in a Pearl White and Onyx Black color. The Fuji jacket pictured above is around 450 to 500 GSM. Patches: The patches are placed subtly on the chest and shoulder area and you can tell off the bat that is if of high-quality embroidery that is meant to last. Personally, I like the minimal style of the logo, so I plan on keeping this on my Gi. Rubber Collar: The rubber collar prevents sweat absorption, great for fighting off bacteria. I noticed it dried very quickly after a hard rolling session. Although I don't sweat too much, I can see this being an extremely beneficial to those who drown their gyms in sweat. It will help with the odor of the gis and having to wash it after every roll. Arm Length: For me, problems with most gis is that the arm sleeves are always too long or too short after it has been dried. The Fuji gi pictured above was too long ---the sleeve went past my wrist even after washing. However, the JACO gi was a perfect fi with my arms---the sleeves ended up right at wrist level. Fabric: It is made of a 245 GSM Rip Stop cotton/polyester blend. Pants Patches: The Jaco Unity logo is on the right thigh and if wanted, can be removed. Rope Drawstring: This is where the pants shine. The rope drawstring is unique because it’s made of a thick, yet soft cotton drawstring that emulates the ones you’d see on a premium sports sack pack. You can tell Jaco put some effort into these because it’s not the typical ones you see on a Gi and these are built to last. Belt Loops: There are 3 belt loops on each side, the color matching the stitching of the pants. I’ve had this Gi for a little while now and I am still breaking into it. So far, it has shown no sign of wear and tear. Given how lightweight the material feels, I am actually very happy that it has held up with the amount of beating it has received. This Gi retails for $189.99. It is a bit higher priced compared to its peers on the market. You can find a 350 GSM gi for around $100 on Amazon. Personally, I like the look of this gi more than some of the other 350 GSM gis on the market. However, I do not have another 350 GSM gi to compare the quality of so I cannot say anything about the quality of the other GSM gis on the market. I can only vouch for this gi. But they did give me a discount code to pass onto my readers for 10% off. So if you want to buy it, you can save about $20 off of the purchase. Just use my affiliate code JACOxMMALIFE when buying. This gi is definitely one of the nicer gis I've tried. There is no doubt about that. However, the price point is out of reach for most beginners and casuals. 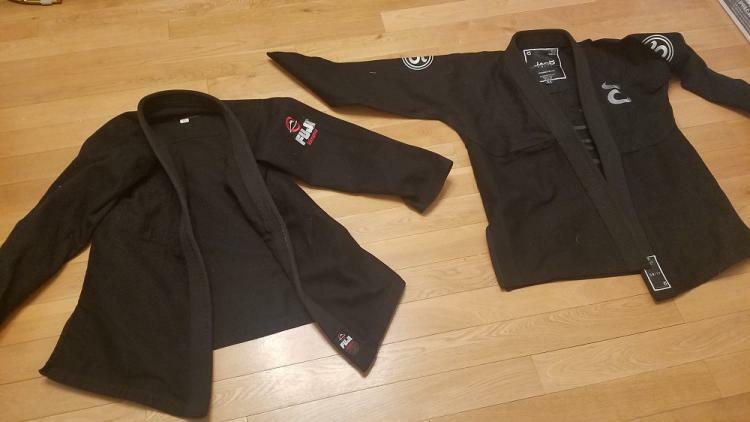 However, if you are planning on doing jiu jitsu for a long time and plan on competing (especially at IBJJF events), this gi is probably a good investment. It's been a good month now of wearing it and it has fared very well while one of my other cheap $60 gis ripped after a month of usage after practicing takedowns. If I keep using it and it rips after a few months, I will update the review. Overall it is a good investment if you have the money to swing, just make sure that you are going to use it often if you buy it. If you buy, make sure to use the coupon code JACOxMMALIFE (affiliate link). StairMaster Boxmaster with Base Review, Is it Worth It?